What are the unexpected benefits of Making Tax Digital? The deadline for Making Tax Digital is fast approaching and for businesses who are still getting to grips with the changes they need to make, the process can seem daunting. Put simply, from April 1, businesses above the VAT threshold of £85,000 need to keep digital records and submit their returns using HMRC compatible software. Although 30,000 businesses have already signed up, many have further work to do. So, why the fuss? And what benefits will this initial disruption to the way people work have? Here’s how you can use the new government requirements as a positive catalyst for change. If you feel as though you’re behind the curve, and you’ve put off updating the technologies you use, now is the time to change. Making Tax Digital will transform the way you work, making you faster and more efficient, which will bring huge benefits, including more accurate recording of figures with less room for error. Cash flow is the beating heart of any company, so getting this right will enable you to keep growing, hit targets and feel truly confident about your future. And, having adopted changes to the way you manage your finances, why stop there? Taking steps to make your tax digital will invariably increase your confidence to push for digital transformation across the board. Are you outsourcing your accounts or are you managing your finances in-house? Many people choose to take advantage of the expertise external companies can provide. This takes the pressure off filing tax returns and allows you to concentrate on other areas, such as sales and marketing. If you have an accountancy firm, then relax, as they will have everything covered. However, Making Tax Digital, also gives you the option to consider bringing your finances in-house. Having someone on the team internally, who can advise on business decisions, can add strategic value – and, thanks to new software systems, this option is so much more viable than before. By implementing new technology, it’s possible to cut down on employee workload so that you need less manpower to complete the same tasks as before. Research (The Productivity Payout: Small Businesses and the Digital Economy by Volterra Partners in association with QuickBooks) predicts that maxing tax digital could lead to increased profits of £1.6 billion in London and £6.9 billion across the UK. Why? Because when cashflow is managed efficiently, companies get paid faster and have access to capital for growth. A recent survey of over 150 accountancy firms shows that the way we record our finances as a nation desperately needs updating. An alarming 16 per cent of accountants recorded clients who still keep their receipts in a shoebox! 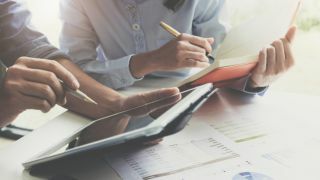 In fact, only 35 per cent of businesses are using software to manage profit and loss, with others relying on manual records and computer spreadsheets. Doing business with a boss who is using outdated processes can be hard work. So, it looks like these changes could be good for the economy as a whole, leading to a ‘snowball effect’ where one person’s good fortune benefits another. To comply with Making Tax Digital, you need software that allows you to submit VAT returns, as well as keeping records of your sales and purchases. So, when you’re looking for software compliant with HMRC, it’s worth considering cloud technology. Not all models are the same, but to put it simply, cloud computing stores everything – from servers and databases to analytics – on the internet. Without the need for expensive hardware, this model keeps your costs low and offers a flexible approach with the option to scale up and down as your business needs change. With this in mind, it’s no surprise that Deloitte research shows small and medium businesses using cloud services as their main function grow 26 per cent faster than those who don’t. In fact, 69 per cent of companies contacted for the survey said they planned to increase their use of cloud technology. Keeping digital records has so many advantages. With all your records in one place, you won’t have to submit information you’ve already given HMRC in the past, and most importantly, they can process your figures in real-time. You won’t have to wait to the end of the year to find out how much you owe, helping you to balance your books accurately. Going paperless means that employees don’t have to be in the office to view your finances, and with an estimated 1.5 million remote workers in the UK, this is a shift to fit in with modern working practices. Finally, if you want to avoid sitting in a phone queue, thanks to Making Tax Digital, you have an alternative – interacting digitally with HMRC through web chat and secure messaging.